What's the deal with the butterfly? Look closely and in the wings of our butterfly, you can see two faces. One symbolizes looking to the past and the beauty of the youthful years of Inman Park and the other looks ahead to the future of our blossoming neighborhood. 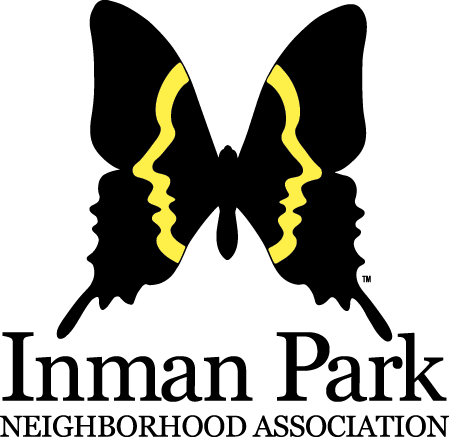 The Inman Park butterfly logo was created by resident Ken Thompson in 1970. At the time, the "restoration pioneers" who were updating homes needed a unifying symbol of their spirit that reflected both past and future. The butterfly has always been the quintessential symbol of beautiful transformation, and a fitting symbol for the continuing evolution of the Inman Park neighborhood. The Inman Park Butterfly logo is a registered trademark of the Inman Park Neighborhood Association. The neighborhood does not issue licenses to use our trademark butterfly for commercial purposes.